We present a modeling language for the model-driven development of secure, distributed systems based on the Unified Modeling Language (UML). Our approach is based on role-based access control with additional support for specifying authorization constraints. We show how UML can be used to specify information related to access control in the overall design of an application and how this information can be used to automatically generate complete access control infrastructures. Our approach can be used to improve productivity during the development of secure distributed systems and the quality of the resulting systems. This work has been supported by the German ”Bundesministerium für Wirtschaft und Technologie” under the reference number IT-MM-01MS107. The authors are responsible for the content of this publication. BEA Systems, Inc. Programming WebLogic Enterprise JavaBeans, 2002. http://e-docs.bea.com/wls/docs6l/pdf/ejb.pdf. Interactive Objects Software GmbH. ArcStylerExtensibility Guide, 2002. http://www.io-software.com/as-support/docu/extensibility-guide.pdf. Koch, A. Uhl, and D. Weise. Model Driven Architecture. Technical report, Interactive Objects Software GmbH, 2002. http://cgi. omg. org/ cgi-bin /doc?ormsc/ 02-01-04.pdf. Object Management Group. 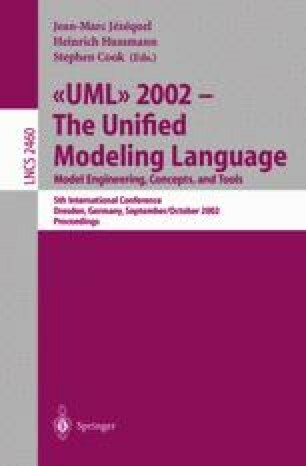 OMG Unified Modeling Language Specification, Version 1.4, 2001. http://www.omg.org/technology/documents/formal/uml.htm. Sun Microsystems, Inc. Enterprise JavaBeans Specification, Version 2.0, 2001. http://java.sun.com/ejb/docs.html.